After all the clutter of the holidays -- presents opened, guests and family departed -- what's a better way to start the new year than by clearing things out, getting everything back in order and making a few changes to freshen up your home. Away with 2012. It's 2013! Our friend Maxwell Gillingham-Ryan from Apartment Therapy gave us some great ideas how to organize and de-clutter, how to use color to develop your style and a few simple cleaning tips to keep everything fresh. These are simple steps you can take today that will make a world of difference regardless of whether you live a tiny apartment or a great big house. That's right! A grapefruit is the key to a clean tub that will smell oh-so-amazing. Just get one grapefruit and a quarter cup of kosher salt. 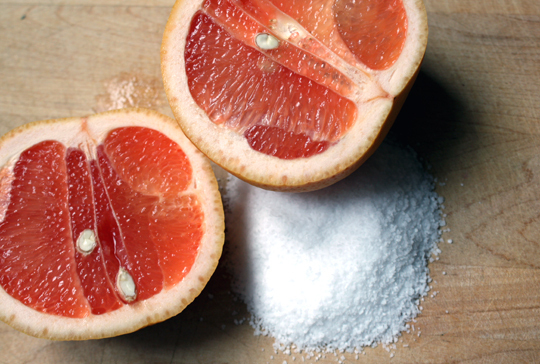 Halve the grapefruit and sprinkle it liberally with salt. Sprinkle the remaining salt in the tub, wet all the surfaces and get scrubbing. One large grapefruit will do the whole bath plus fixtures. Then just rinse thoroughly and your tub will be squeaky clean and smell fantastic.